This marble statue is a copy of a Roman original. The statue stands at 36" high near a path to Allerton House. The artwork was a gift of Robert Allerton in 1946. 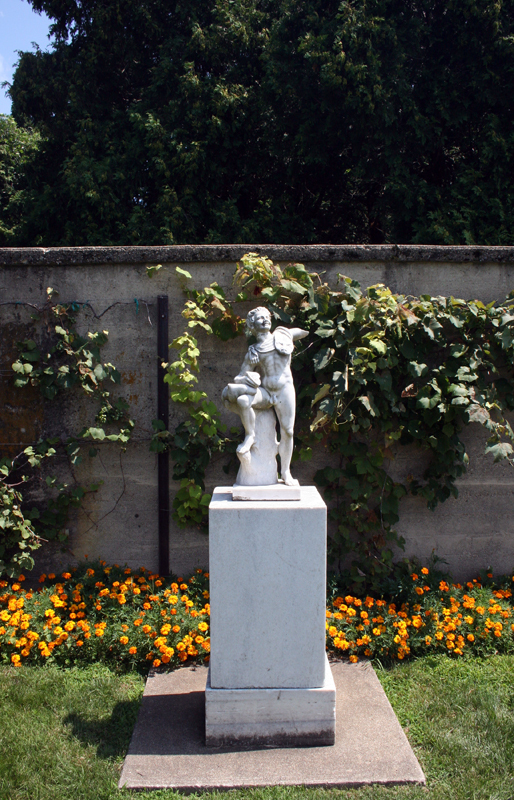 Based on a Roman original in the Naples Museum, this little garden statue is located near a path leading from the parking lot to Allerton House. The sharply pointed ears, animal skin about its neck, wine sack resting on the knee, and distinctly jovial demeanor suggest a mythological reveler, which is what the figure does in fact represent. In an act of vandalism in 1958 the head and left arm were knocked off. Only the head has been found and reset. What remains of the arm is a mutilated stump. 515 Old Timber Rd, Monticello, IL 61856 ~ This piece is near a path leading up to Allerton House. Muriel Scheinman, “Marble Faun, before 1922,” ExploreCU, accessed April 19, 2019, https://explorecu.org/items/show/44.